GBC offers over 70 years experience in designing and producing top-quality shredders. GBC office shredders come with a complete three-years warranty (with five years to lifetime warranty on cutting heads), and GBC has the industry's only on-site factory service program plus hundreds of servicing dealers. 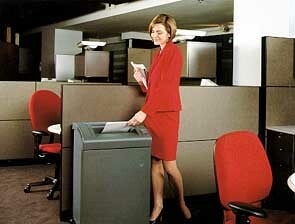 Office shredders are powerful and designed for heavy use by an individual or general office use. These shredders feature continuous-duty motors. The exclusive Jam-Stopper Electronics provide Auto Stop on Jam to minimize motor wear and tear. Deep, funnel-shaped throat simplifies paper feeding by accommodating oversized sheets and disorganized stacks. An automatic on/off provides convenient one-handed operation. Large shred bins allow for long runs between bag changes and casters provide easy mobility. 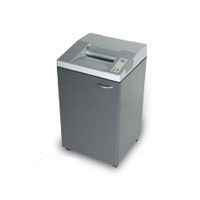 The GBC 4550X Office Shredder - Large 36 gallon shred bin. Chops 14 to16 sheets per pass into over 300 bits. The shredder has an auto on-off button. EZ-feed throat. Bag full shut off. The shredder also has an auto on-off jam. SmartShred Controls+E919-separate indicator lights for power on, bin full, overload and door ajar. Continuous duty motor. In-cabinet bag storage. Shred Size (Inches) � 5/32 " x 1-1/2"
Size� 36"H x 21.5"W x 18.6"D.